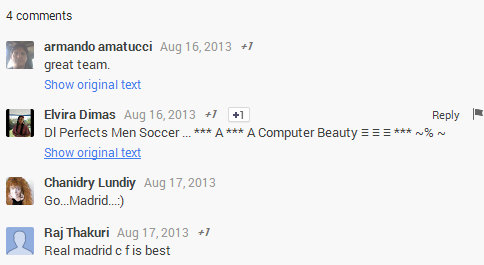 Google+ added translation links for posts and comments written in languages you may not understand. Click "Translate" and Google+ will translate the post and the comments. This only works for public posts and the feature is only available on the desktop Google+ site. This feature is not that useful if you use Chrome, since the browser has a built-in translation feature that works in Google+ just like it works for any other site. "The Google Translate team is always working to make information more accessible to individuals around the world. In Google+ this means bringing people together regardless of their written language, and breaking down language barriers that can limit the exchange of ideas," informs the Google Translate blog. Nice blog. This is a very good blog on English to Marathi dictionary. I would like to thank you for all the information you give. Its really important to choose the best dictionary to learn marathi. So thenks for the information you give. It does not seem unreasonable to suggest that the best techniques to find out the translation by Google is very much in demand in all the possible manner. The free sentence structure check is also helpful to get the correct translated sentence.